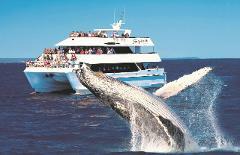 Unforgettable whale adventure. AM Cruise 8.30am to 1.00pm OR PM Cruise 1.30pm to 5.30pm Adult - $100, Conc - $95, Child (4-14yrs) - $60, Family (2a + 2ch) - $280. AVAILABLE LATE JULY TO END OCTOBER 2019. Click on Pic for more info!